Please welcome two special guests today – author Janet Elizabeth Lynn and her husband Will Zeilinger! 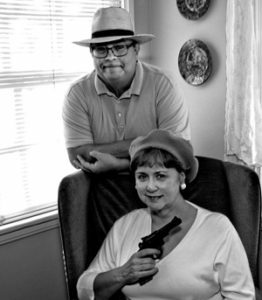 My husband, Will Zeilinger and I co-write the Skylark Drake Murder Mystery series, a hardboiled series that takes the reader to 1950s Los Angeles and other areas of the west. Our new book, Slick Deal, begins News Year’s Eve 1956 at the Hollywood Roosevelt Hotel, The first murder and clues lead to Avalon, Catalina. 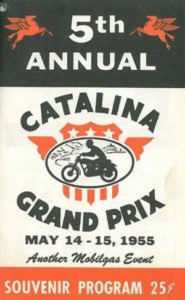 The Catalina GP drew hundreds of racers from across the country, packing boats from Southern California with riders ready to test their motor cycle on the streets and hills. It was a two day, 60-100 mile race. 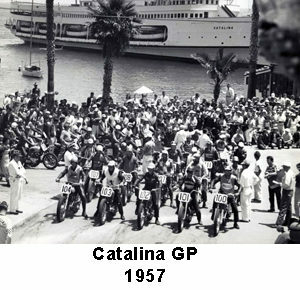 Because the race was held on an island only accessible by boat, the Catalina GP was a one-of-a-kind race. The regular racing rules didn’t apply, allowing motorcycle manufacturers to race test new technology not allowed at other regular events. I found the article in the Avalon Library. I went through old newspapers from 1956 (with white cotton gloves.) As soon as I finished reading it, an amazing subplot came to me. I handed the article to Will, he read it and he was also inspired. We took copious notes, put everything back and got back to our hotel to write. We went back the next day to research more about the popular race and why it no longer is held. The race was discontinued after 1958 for many reasons. 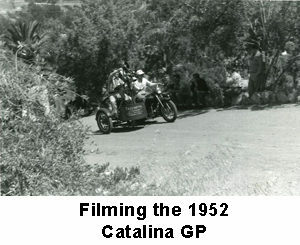 Some motorcycle racers and their fans, began to take on a tough, hard drinking, rebellious image. They took advantage of the small town and its citizens. Property damage, actual attacks on island residents (the mayor being one of them). What seemed to burst the balloon, was actor Lee Marvin. It was reported that he tried to incite a mutiny on the homebound ship. Full of drunk and rough housing people, the captain took Lee seriously, put on his side arm and contacted the Harbor Patrol. As the article said,Marvin had some explaining to do. The local police force was small. To help with the large crowds coming for the event, volunteer law enforcers were recruited from the town. However, with their inexperience, they were helpless and outnumbered. The decision was then made to discontinue the race and initial steps were also taken to change over from the local police to an agreement with Los Angeles County Sheriff’s Department. The event returned, in 2010. One of the original four Yamaha bikes from 1958 raced after a 52 year absence. 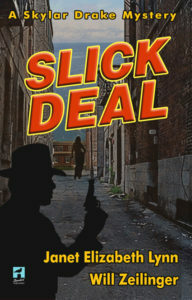 SLICK DEAL is the fourth in the series…and yes we are still married! Follow Janet and her husband at their websites! Here’s more about the new book, Slick Deal! Last but not least, here’s an excerpt! Almost midnight. I was working security for the New Year’s Eve bash at the posh Hollywood Roosevelt Hotel with my partner Casey Dolan. The rented tuxedos we were wearing made us look like we belonged with the rich crowd down on the ballroom floor, but we were working. This was one of the most exclusive parties in the city. I’d been here before and I’ve never known any other hotel with the kind of history this place had. Our job tonight was to keep an eye out for trouble…and I suppose this was a much better way to greet the new year than sitting at home in front of the television with a bottle of whiskey. As a matter of principle, I didn’t take security work. But Dolan thought D&D Investigations would benefit from this job by keeping the lights on and paying our secretary. He was right. I scanned the crowd and checked my watch—a minute before midnight. The noise level in the room escalated with anticipation. I spotted Dolan at his post under an archway on the other side of the room and smiled. He nodded. From my spot on the catwalk above the ballroom floor I watched as they counted down the last seconds—five, four, three, two… Just as the clock on stage struck midnight, the room exploded with shouts, horns, balloons, and a snowstorm of confetti. The band played “Auld Lang Syne” while a banner unfurled above the bandstand that proclaimed: HAPPY NEW YEAR 1956. It seemed as though everyone in the world was dancing, hugging, and kissing. My mind disappeared into the past. I remembered my late wife, Claire, and how we celebrated every New Year together. Even when she was big with our daughter, Ellie, Claire was stunning. I pulled out my wallet and gazed at her photo. I miss you honey, so very much. I motioned for Dolan to stay put while I ducked behind the heavy drapes and crossed the hall to the lobby mezzanine. Fourteen steps would take me down to the lobby floor. I think I only used five. My hand automatically went to my holster, just in case. Pushing through the crowd, I found a portly man on his back in a pool of blood on the terracotta-tiled floor. A tuxedo-clad man loosened the tie of the victim but I knew he was gone. I’d seen that vacant look in his eyes a hundred times back when I worked LAPD homicide. Somewhere in the crowd I heard “Make way please, we’re nurses.” A couple of women in evening gowns appeared. I held the curious crowd back while the women knelt on the bloody floor and checked for a pulse. One shook her head and placed a lacy handkerchief over the dead man’s face. Screaming sirens outside announced the arrival of the police. Partygoers scrambled. More than a few were probably here with someone other than the one to whom they were legally and lawfully wed. I identified myself as hotel security to the first officers to come through the door. “You were first on the scene?” one asked. More police swarmed the lobby with news reporters on their heels. I wasn’t surprised. This party attracted reporters like flies on a dead cat. All around camera flashbulbs popped, making the room as bright as day. Someone grabbed my arm. I looked into the eyes of a dark-haired woman wearing a full-length fur coat. With all the commotion, I thought she was a tipsy guest who wanted to kiss me. Instead, she pulled in close and whispered in my ear, “Please help me get out of this place. I can’t be seen here.” She turned her back to the cameras. With one hand, she yanked the combs from her hair and let it cascade down to her shoulders. She had the aroma of flowers. Then she turned up the collar of her fur coat to cover part of her face. Tears rolled down her cheeks. I saw the desperation in her eyes. The elevators and outside doors were blocked by uniformed cops. I whisked her toward a side room. A cop in a cheap brown suit noticed us walking away and yelled, “Hey, you two. Get back here.” I used to be a cop and I knew one when I saw one. This guy was probably a plainclothes detective. “You’re interfering with a police investigation,” he yelled. I noticed her striking resemblance to Ava Gardner. I pulled her along and headed to an empty room. The cop caught up with us as I pushed open the door and turned on the light. I pulled out my PI license. He grabbed it from my hand just as I moved my jacket to show him my gun. “You have your job and I have mine.” I nodded toward the raven-haired beauty standing behind me. “You stay put, Drake, while we sort this out.” I held up three fingers in a Boy Scout salute. He frowned and backed out the door. My mind raced with a hundred things she wanted me to be discreet about. Before the detective could get out another word, I slipped out the door and walked back to the lobby. I checked the time—two a.m. The police had finished with most of the guests and allowed them to leave. The party was over. My job was done. Jim, Thank you for hosting us on your blog.